As the UK has experienced temperatures towards 35C so far this summer, sweaty Britons may have wished they had air conditioning at home as well as at work. And in future they probably will. According to the latest National Grid scenario modelling, the number of domestic air conditioners in this country could soar from negligible today to 20 million by 2050, with enormous impacts on the electricity grid. It is a sharp reminder of our urgent need to develop clean cold technologies and a circular ‘cold economy’, as proposed two years ago by the Birmingham Policy Commission on Cold (PDF). In one of National Grid’s scenarios, global temperatures rise by almost 3C on average, and heat waves like the one in 2003 – when the temperature in Faversham topped 38C – become a normal summer during the 2040s. By 2050 domestic air conditioners would consume 11TWh of electricity per year – equal to the current total consumption of Estonia – but cause peak demand on a summer weekend afternoon to triple from under 20GW today to over 70GW. So extreme is the projected impact of domestic air conditioning that Britain will become a ‘twin peaks’ electricity system, with both a traditional winter late afternoon peak and a summer afternoon peak – making it harder for electricity generators to shut down power stations in summer for maintenance. Solar power will offset some of the increase but far from all of it, since the solar peak comes at midday rather than the end of the afternoon when temperatures are highest. 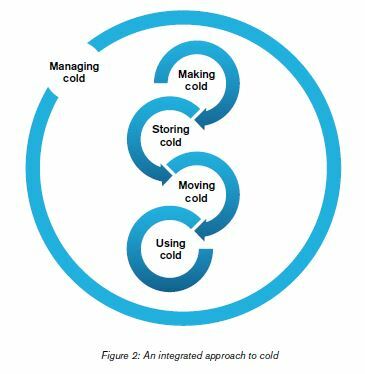 The system level approach to cold that forms the basis of the Cold Economy can be represented as five interlocking functions. Britain is far from unique, however. The global air conditioner fleet is forecast to grow by 1.6 billion units by 2050, when we shall consumer more energy for cooling than heating. By the end of the century air conditioning could consume around half the electricity generated worldwide for all purposes in 2010. And air conditioning is just one form of cooling: demand for refrigeration, food and pharmaceutical cold chains, and data centres is also soaring. So far, the scale of the challenge has scarcely been recognised: to power air conditioning alone in 2100 would require ten times our current wind capacity, while in the Gulf they project they will need to spend $100 of cooling equipment to 2030 but $125bn on new generation capacity. All of which means we need to take a hard look at how we provide cooling and devise a radically more efficient approach. The problem is that when people talk about energy, they often mean electricity, and when they talk about energy storage, they mean batteries. This blurring of concepts matters because it fails to recognise some basic energy facts-of-life: that a large slice of our consumption comes in the form of thermal energy; that one of the fastest growing sources of energy demand over the next twenty years will be for cooling; and that cooling would often be better served by energy carriers other than electricity and batteries. This system approach would both mitigate the pressure of cooling loads on electricity grids around the world, but also greatly improve the resource efficiency and environmental footprint of cooling – the ‘cold economy’. The National Grid’s modelling shows this approach makes sense not just for the countries we traditionally consider hot, but for the UK too. Luckily Britain has developed world-leading expertise in clean cold through its innovative start-ups and universities, so the cold economy is not simply an environmental imperative, but also a major economic opportunity. The government’s new Industrial Strategy is intended to foster innovation, new industries, growth and international trade. It is hard to think of an emerging global sector that meets all these criteria better than clean cooling, where Britain has already established a global lead. Britain should seize this opportunity both to tame its own cooling demand before it becomes a serious problem, and to generate exports and jobs. Tags: air conditioning, clean cold, climate change, Electricity. Bookmark the permalink.